* Ornamental clinker brick chimneys. i.e. a ridge of white or black mortar ran along the joints between the bricks. * Massive pylons supported a flat roof or gable to the porch. Each new house was by this stage detached and isolated in its own garden, with few exceptions. Attention to sun orientation was considered for the first time, and protection was given by a wider eave with a lower roof pitch, builders began adopting these devices as Californian Bungalow types. The hallmark of bungalow construction were function and economy, and an attempt to portray a naturalness. The house sat low on the ground, using natural materials such as large timbers and rubble stone work complemented with rough cast pebble dash - these rough textures were soon conventional. 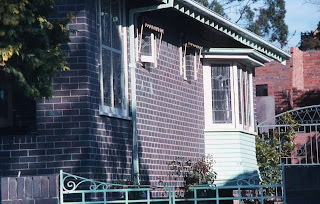 Shingles were fixed decoratively in the wide overhanging gables with Marseilles tiles still used with walls of brick, or frequently seen rough cast and weatherboard cladding. Large gable ends, often nestled with one protruding beyond the other, became the main decorative feature and some continued to use decorative strapping imitating the roof structure. The front porch, wether gabled or low slung across the front of the house, was supported on massive brick or rubblestone pylons. The front porch or verandah became enclosed in character, due to the low masonry walls joining the large pylons. The red roof and brickwork were complemented by green, brown, black and white paint work with some timbers decoratively stained or oiled. This period was one of minimal decoration. Import restrictions on European timbers turned builders to local hardwoods for joinery and floors. Panels were simple and taken high up the wall. Ceilings were also often panelled and battened. The use of wallpaper was minimized, often to a mere frieze below the picture rail. The drawing room and main bedroom often had mock timber beams stained dark walnut against a white ceiling. Planning became slightly more open, with double glazed doors between the sitting and dinning rooms giving an illusion of space to this generally small house, with ceilings now lowered to around three metres. Lathe and plaster was being replaced by fibrous plaster sheeting with small stock cornices and square moulds around wall panels. Brickwork over doors and windows was carried on pre-cast concrete lintels. Attic rooms and dormer balconies were often incorporated. Front fences surrounding neat gardens used various materials and styles, including woven wire, timber rails, low masonry (which was at times stuccoed) and pickets. The garage was becoming more popular and sat at the side or rear of the block to house the much loved motor car. 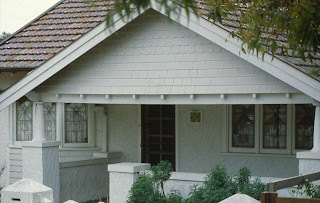 The very first example of a Californian Bungalow house was located on Gardeners Road Rosebery, the building was a pre fabricated house imported into Australia from the United States and erected just before the end of WW1. Unfortunately it was demolished in the early 60's to make way for a block of flats, so much for progress.